Have you ever looked at the current crop of mid rise residential buildings cropping up around Portland and wondered why they just seem “different” from the architecture of previous generations? Here’s an example of a building that really exemplifies the architectural zeitgeist of early 21st century North America. What if those historical buildings were styled like their contemporary brethren? Let’s try it out! Here’s a splendid older building, the Morrison Park building, constructed in 1912 (and in which the author lived at the turn of the millennium). Symmetry is so stodgy! A ribbon of Hardiepanel would addd dynamism! Get rid of that cornice! We can’t have fake history! We could put flanges around some randomly selected stacks of windows to infuse this dull facade with some verticality and break up the box!” Now it’s human scale! Let’s be glad our predecessors didn’t leave us with such a crappy built environment. Instead, lets not be so quick to dismiss the basics of symmetry and proportion that have served us so well for so long. In the quest for uniqueness and variety, we end up with a spectacular amount of sameness that looks dated before the last coat of paint even dries. This is partially due to the use of prefabricated assemblies of off-the-shelf parts and partially due to a complete failure to apply any internally consistent code of visual composition. Every style has it’s own vocabulary, and they’re really not that difficult to grasp. 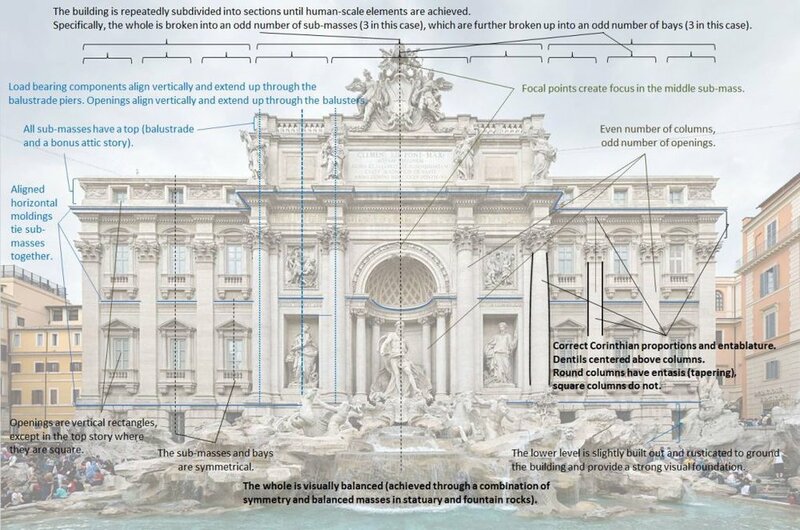 Analysis of the order and compositional hierarchy of the Trevi Fountain. We need not even be so strictly literal about the application of the palazzo style (the basic composition of our Morrison Park example) to benefit from its application in a contemporary context. King Street Lofts again, completed. Not the shadowy undercut at the ground level, the inverse of the solid base that anchored palazzo buildings.